Euthanizing the Third Secret: The New Theology Tries to Kill the Secret with Lethal Modernist Gas....What they did not realize is that they accidentally slipped in a canister of Laughing Gas! A careful reading of the text of the so-called third “secret” of Fatima, published here in its entirety long after the fact and by decision of the Holy Father, will probably prove disappointing or surprising after all the speculation it has stirred. It will be "disappointing" because it does not resemble IN ANY WAY the revelation that the world was expecting for some 40 years. Notice that the pronounced understanding of the world and Church Militant with regard to the Third Secret is contemptuously called "speculation." Since this is the Third Secret "in its entirety" and since it is done "by decision of the Holy Father" we know that this entire secret as "revealed" will be NOTHING like what has been expected. This substituted Secret will be the "final" version which will lay the entire Fatima Problem to rest. So there, prophets of doom! Your great warning conveyed by the Mother of God to the world is no more, and a forced trite image will serve only to glorify the revolution in the Church that the Secret was, no doubt, meant to warn against. No great mystery is revealed; So much for keeping it secret for 83 years. So much for being willing to endure being boiled in oil --- as a young child --- to not reveal the Secret, that the Lady saw as so important. Nothing great here! nor is the future unveiled. Well, actually, even if you believe that the vision is authentic in some way, it most definitely IS ABOUT THE FUTURE. Isn't the Cardinal saying that the Secret was about the decades of Communist oppression of the Church AFTER 1917? Cardinal Ratzinger, here, is simply trying to throw cold water on all the old Catholic hope in the Third Secret. As if it was meant, actually, to offer a helping hand for those trying to navigate their way through the sea of the Neo-pagan world. Sorry, by the time this "secret" is "revealed" it will be an account of something of the past, a clever red herring about an attack by an EXTERNAL ENEMY, instead of an attack upon the those who are inside the Church by those who ONLY SEEM like they are in the Church but who have defected from the Church by their heresy and apostasy. This, more so than any kind of physical annihilation by "arrows," was the greatest threat to the Church in the 20th century. We see the Church of the martyrs of the century which has just passed represented in a scene described in a language which is symbolic and not easy to decipher. Is this what the Mother of the Lord wished to communicate to Christianity and to humanity at a time of great difficulty and distress? Is it of any help to us at the beginning of the new millennium? Obviously, not. That is why this vision has been substituted for the authentic Third Secret. Or are these only projections of the inner world of children, brought up in a climate of profound piety but shaken at the same time by the tempests which threatened their own time? How should we understand the vision? What are we to make of it? Why this shabby attempt to cast the Secret into the swamp of subjectivism and the subjective musings of children. The more this "theological interpretation" goes on the farther the Fatima Message fades into meaninglessness. 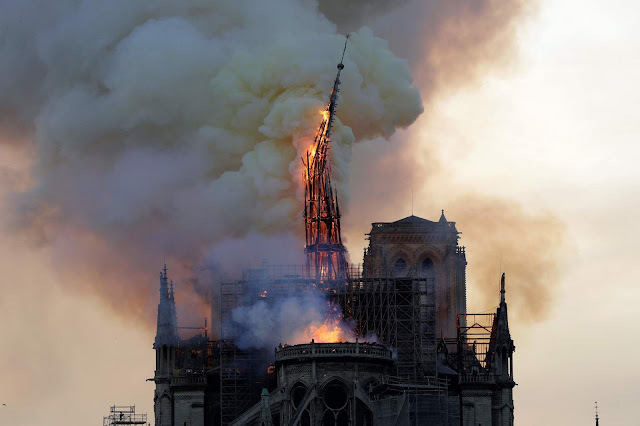 This was also the fate of the Catholic Faith when it transformed by the New Theology's rejection of the distinction between the orders of Nature and Grace. Before attempting an interpretation, the main lines of which can be found in the statement read by Cardinal Sodano on 13 May of this year at the end of the Mass celebrated by the Holy Father in Fatima, there is a need for some basic clarification of the way in which, according to Church teaching, phenomena The word "phenomena" seems to reduce the APPARITION to a psychological event. such as Fatima are to be understood within the life of faith. The teaching of the Church distinguishes between “public Revelation” and “private revelations”. The two realities differ not only in degree but also in essence. The term “public Revelation” refers to the revealing action of God directed to humanity as a whole and which finds its literary expression in the two parts of the Bible: the Old and New Testaments. It is called “Revelation” because in it God gradually made himself known to men, to the point of becoming man himself, in order to draw to himself the whole world and unite it with himself through his Incarnate Son, Jesus Christ. Can we unite the Third Secret to JPII's teaching on universal salvation.....lets try! It is not a matter therefore of intellectual communication, but of a life-giving process in which God comes to meet man. Again, Fatima is about to meet New Theology. Are we ever going to be told that God became Incarnate in order to REDEEM MAN with HIS MOST PRECIOUS BLOOD BY SHEDDING IT ON THE CROSS. See Trinitarian Apparition at Tuy. At the same time this process naturally produces data pertaining to the mind and to the understanding of the mystery of God. It is a process which involves man in his entirety and therefore reason as well, A bit stupid and irrational this Third Secret, implies Ratzinger but not reason alone. Because God is one, history, which he shares with humanity Cardinal Ratzinger: Well at least this farcical "Third Secret" gives us the opportunity to inject some New Theology into those stupid masses who actually wanted to hear something clear from the Mother of God to help them in their own life of faith! So much for thinking that God was eternal and unchanging!, is also one. It is valid for all time, and it has reached its fulfillment in the life, death and resurrection of Jesus Christ. In Christ, God has said everything, that is, he has revealed himself completely, and therefore Revelation came to an end with the fulfilment of the mystery of Christ as enunciated in the New Testament. To explain the finality and completeness of Revelation, the Catechism of the Catholic Church quotes a text of Saint John of the Cross: “In giving us his Son, his only Word (for he possesses no other), he spoke everything to us at once in this sole Word—and he has no more to say... because what he spoke before to the prophets in parts, he has now spoken all at once by giving us the All Who is His Son. Any person questioning God or desiring some vision or revelation would be guilty not only of foolish behaviour but also of offending him Actually, when rereading this presentation of the "Third Secret," I never expected the Cardinal to be so insulting to those to whom he is addressing himself. Cardinal Ratzinger: So you old ladies "making a visit" ---- obviously did not read my new book God and Man in which I show the uselessness of this since God is everywhere --- and lighting your candles praying to be fortified for whatever disaster the Third Secret prophesied HAVE REALLY BEEN OFFENDING GOD THIS WHOLE TIME, while we modern theologians have been pleasing him by learning the the gobbledy gook above and below and trying to figure out ways to nullify the significance of the Third Secret, by not fixing his eyes entirely upon Christ Mariolatry Mariolatry! and by living with the desire for some other novelty” (No. 65; Saint John of the Cross,The Ascent of Mount Carmel, II, 22). Cardinal Ratzinger: Good thing I did not have to read this at Fatima on May 13th, 2000 --- even the imposter.....what is her real name now --- stage name "Sister Lucia" I remember that --- would have clobbered me! Because the single Revelation of God addressed to all peoples comes to completion with Christ and the witness borne to him in the books of the New Testament, the Church is tied to this unique event of sacred history and to the word of the Bible, which guarantees and interprets it. Ratzinger: Hey, Luther, baby, high five! But this does not mean that the Church can now look only to the past and that she is condemned to sterile repetition. The Catechism of the Catholic Church says in this regard: “...even if Revelation is already complete, it has not been made fully explicit; it remains for Christian faith gradually to grasp its full significance over the course of the centuries” (No. 66). Pure and unadulterated Modernism. Makes room for the new and heretical teachings of Vatican II as "super dogma"! Dr. Chojnowski: I am going to stop and publish my comments so far and then come back to finish the rest. Was this "interpretation" actually intended to be read by normal people? The way in which the Church is bound to both the uniqueness of the event and progress in understanding it is very well illustrated in the farewell discourse of the Lord when, taking leave of his disciples, he says: “I have yet many things to say to you, but you cannot bear them now. When the Spirit of truth comes, he will guide you into all the truth; for he will not speak on his own authority... He will glorify me, for he will take what is mine and declare it to you” (Jn 16:12-14). On the one hand, the Spirit acts as a guide who discloses a knowledge previously unreachable because the premise was missing—this is the boundless breadth and depth of Christian faith. On the other hand, to be guided by the Spirit is also “to draw from” the riches of Jesus Christ himself, the inexhaustible depths of which appear in the way the Spirit leads. In this regard, the Catechism cites profound words of Pope Gregory the Great: “The sacred Scriptures grow with the one who reads them” (No. 94; Gregory the Great,Homilia in Ezechielem I, 7, 8). The Second Vatican Council notes three essential ways in which the Spirit guides in the Church, and therefore three ways in which “the word grows”: through the meditation and study of the faithful, through the deep understanding which comes from spiritual experience, and through the preaching of “those who, in the succession of the episcopate, have received the sure charism of truth” (Dei Verbum, 8). The criterion for the truth and value of a private revelation is therefore its orientation to Christ himself. When it leads us away from him, when it becomes independent of him or even presents itself as another and better plan of salvation, more important than the Gospel, then it certainly does not come from the Holy Spirit, who guides us more deeply into the Gospel and not away from it. This does not mean that a private revelation will not offer new emphases or give rise to new devotional forms, or deepen and spread older forms. But in all of this there must be a nurturing of faith, hope and love, which are the unchanging path to salvation for everyone. We might add that private revelations often spring from popular piety and leave their stamp on it, giving it a new impulse and opening the way for new forms of it. Nor does this exclude that they will have an effect even on the liturgy, as we see for instance in the feasts of Corpus Christi and of the Sacred Heart of Jesus. From one point of view, the relationship between Revelation and private revelations appears in the relationship between the liturgy and popular piety: the liturgy is the criterion, it is the living form of the Church as a whole, fed directly by the Gospel. Popular piety is a sign that the faith is spreading its roots into the heart of a people in such a way that it reaches into daily life. Popular religiosity is the first and fundamental mode of “inculturation” of the faith. While it must always take its lead and direction from the liturgy, it in turn enriches the faith by involving the heart. We have thus moved from the somewhat negative clarifications, initially needed, to a positive definition of private revelations. How can they be classified correctly in relation to Scripture? To which theological category do they belong? The oldest letter of Saint Paul which has been preserved, perhaps the oldest of the New Testament texts, the First Letter to the Thessalonians, seems to me to point the way. The Apostle says: “Do not quench the Spirit, do not despise prophesying, but test everything, holding fast to what is good” (5:19-21). In every age the Church has received the charism of prophecy, which must be scrutinized but not scorned. On this point, it should be kept in mind that prophecy in the biblical sense does not mean to predict the future but to explain the will of God for the present, and therefore show the right path to take for the future. A person who foretells what is going to happen responds to the curiosity of the mind, which wants to draw back the veil on the future. The prophet speaks to the blindness of will and of reason, and declares the will of God as an indication and demand for the present time. In this case, prediction of the future is of secondary importance. What is essential is the actualization of the definitive Revelation, which concerns me at the deepest level. The prophetic word is a warning or a consolation, or both together. 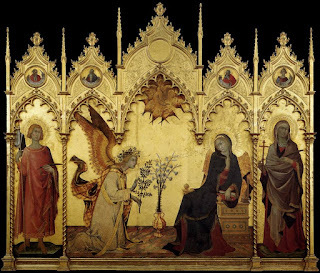 In this sense there is a link between the charism of prophecy and the category of “the signs of the times”, which Vatican II brought to light anew: “You know how to interpret the appearance of earth and sky; why then do you not know how to interpret the present time?” (Lk 12:56). In this saying of Jesus, the “signs of the times” must be understood as the path he was taking, indeed it must be understood as Jesus himself. To interpret the signs of the times in the light of faith means to recognize the presence of Christ in every age. In the private revelations approved by the Church—and therefore also in Fatima—this is the point: they help us to understand the signs of the times and to respond to them rightly in faith. In these reflections we have sought so far to identify the theological status of private revelations. Before undertaking an interpretation of the message of Fatima, we must still attempt briefly to offer some clarification of their anthropological (psychological) character. In this field, theological anthropology distinguishes three forms of perception or “vision”: vision with the senses, and hence exterior bodily perception, interior perception, and spiritual vision (visio sensibilis - imaginativa - intellectualis). It is clear that in the visions of Lourdes, Fatima and other places it is not a question of normal exterior perception of the senses: the images and forms which are seen are not located spatially, as is the case for example with a tree or a house. This is perfectly obvious, for instance, as regards the vision of hell (described in the first part of the Fatima “secret”) or even the vision described in the third part of the “secret”. But the same can be very easily shown with regard to other visions, especially since not everybody present saw them, but only the “visionaries”. It is also clear that it is not a matter of a “vision” in the mind, without images, as occurs at the higher levels of mysticism. Therefore we are dealing with the middle category, interior perception. For the visionary, this perception certainly has the force of a presence, equivalent for that person to an external manifestation to the senses. “Interior vision” is not fantasy but, as we have said, a true and valid means of verification. But it also has its limitations. Even in exterior vision the subjective element is always present. We do not see the pure object, but it comes to us through the filter of our senses, which carry out a work of translation. This is still more evident in the case of interior vision, especially when it involves realities which in themselves transcend our horizon. The subject, the visionary, is still more powerfully involved. He sees insofar as he is able, in the modes of representation and consciousness available to him. In the case of interior vision, the process of translation is even more extensive than in exterior vision, for the subject shares in an essential way in the formation of the image of what appears. He can arrive at the image only within the bounds of his capacities and possibilities. Such visions therefore are never simple “photographs” of the other world, but are influenced by the potentialities and limitations of the perceiving subject. This can be demonstrated in all the great visions of the saints; and naturally it is also true of the visions of the children at Fatima. The images described by them are by no means a simple expression of their fantasy, but the result of a real perception of a higher and interior origin. But neither should they be thought of as if for a moment the veil of the other world were drawn back, with heaven appearing in its pure essence, as one day we hope to see it in our definitive union with God. Rather the images are, in a manner of speaking, a synthesis of the impulse coming from on high and the capacity to receive this impulse in the visionaries, that is, the children. For this reason, the figurative language of the visions is symbolic. In this regard, Cardinal Sodano stated: “[they] do not describe photographically the details of future events, but synthesize and compress against a single background facts which extend through time in an unspecified succession and duration”. This compression of time and place in a single image is typical of such visions, which for the most part can be deciphered only in retrospect. Not every element of the vision has to have a specific historical sense. It is the vision as a whole that matters, and the details must be understood on the basis of the images taken in their entirety. The central element of the image is revealed where it coincides with what is the focal point of Christian “prophecy” itself: the centre is found where the vision becomes a summons and a guide to the will of God. The first and second parts of the “secret” of Fatima have already been so amply discussed in the relative literature that there is no need to deal with them again here. I would just like to recall briefly the most significant point. For one terrible moment, the children were given a vision of hell. They saw the fall of “the souls of poor sinners”. And now they are told why they have been exposed to this moment: “in order to save souls”—to show the way to salvation. The words of the First Letter of Peter come to mind: “As the outcome of your faith you obtain the salvation of your souls” (1:9). To reach this goal, the way indicated —surprisingly for people from the Anglo-Saxon and German cultural world—is devotion to the Immaculate Heart of Mary. A brief comment may suffice to explain this. In biblical language, the “heart” indicates the centre of human life, the point where reason, will, temperament and sensitivity converge, where the person finds his unity and his interior orientation. According to Matthew 5:8, the “immaculate heart” is a heart which, with God's grace, has come to perfect interior unity and therefore “sees God”. To be “devoted” to the Immaculate Heart of Mary means therefore to embrace this attitude of heart, which makes the fiat—“your will be done”—the defining centre of one's whole life. It might be objected that we should not place a human being between ourselves and Christ. But then we remember that Paul did not hesitate to say to his communities: “imitate me” (1 Cor 4:16; Phil 3:17; 1 Th 1:6; 2 Th 3:7, 9). In the Apostle they could see concretely what it meant to follow Christ. But from whom might we better learn in every age than from the Mother of the Lord? Thus we come finally to the third part of the “secret” of Fatima which for the first time is being published in its entirety. As is clear from the documentation presented here, the interpretation offered by Cardinal Sodano in his statement of 13 May was first put personally to Sister Lucia. Sister Lucia responded by pointing out that she had received the vision but not its interpretation. The interpretation, she said, belonged not to the visionary but to the Church. After reading the text, however, she said that this interpretation corresponded to what she had experienced and that on her part she thought the interpretation correct. In what follows, therefore, we can only attempt to provide a deeper foundation for this interpretation, on the basis of the criteria already considered. “To save souls” has emerged as the key word of the first and second parts of the “secret”, and the key word of this third part is the threefold cry: “Penance, Penance, Penance!” The beginning of the Gospel comes to mind: “Repent and believe the Good News” (Mk 1:15). To understand the signs of the times means to accept the urgency of penance – of conversion – of faith. This is the correct response to this moment of history, characterized by the grave perils outlined in the images that follow. Allow me to add here a personal recollection: in a conversation with me Sister Lucia said that it appeared ever more clearly to her that the purpose of all the apparitions was to help people to grow more and more in faith, hope and love—everything else was intended to lead to this. Let us now examine more closely the single images. The angel with the flaming sword on the left of the Mother of God recalls similar images in the Book of Revelation. 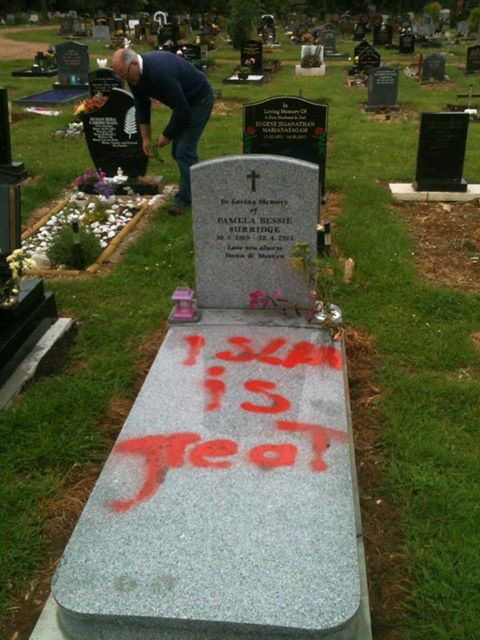 This represents the threat of judgement which looms over the world. Today the prospect that the world might be reduced to ashes by a sea of fire no longer seems pure fantasy: man himself, with his inventions, has forged the flaming sword. The vision then shows the power which stands opposed to the force of destruction—the splendour of the Mother of God and, stemming from this in a certain way, the summons to penance. In this way, the importance of human freedom is underlined: the future is not in fact unchangeably set, and the image which the children saw is in no way a film preview of a future in which nothing can be changed. Indeed, the whole point of the vision is to bring freedom onto the scene and to steer freedom in a positive direction. The purpose of the vision is not to show a film of an irrevocably fixed future. Its meaning is exactly the opposite: it is meant to mobilize the forces of change in the right direction. Therefore we must totally discount fatalistic explanations of the “secret”, such as, for example, the claim that the would-be assassin of 13 May 1981 was merely an instrument of the divine plan guided by Providence and could not therefore have acted freely, or other similar ideas in circulation. Rather, the vision speaks of dangers and how we might be saved from them. The next phrases of the text show very clearly once again the symbolic character of the vision: God remains immeasurable, and is the light which surpasses every vision of ours. Human persons appear as in a mirror. We must always keep in mind the limits in the vision itself, which here are indicated visually. The future appears only “in a mirror dimly” (1 Cor13:12). Let us now consider the individual images which follow in the text of the “secret”. The place of the action is described in three symbols: a steep mountain, a great city reduced to ruins and finally a large rough-hewn cross. The mountain and city symbolize the arena of human history: history as an arduous ascent to the summit, history as the arena of human creativity and social harmony, but at the same time a place of destruction, where man actually destroys the fruits of his own work. The city can be the place of communion and progress, but also of danger and the most extreme menace. On the mountain stands the cross—the goal and guide of history. The cross transforms destruction into salvation; it stands as a sign of history's misery but also as a promise for history. At this point human persons appear: the Bishop dressed in white (“we had the impression that it was the Holy Father”), other Bishops, priests, men and women Religious, and men and women of different ranks and social positions. The Pope seems to precede the others, trembling and suffering because of all the horrors around him. Not only do the houses of the city lie half in ruins, but he makes his way among the corpses of the dead. The Church's path is thus described as a Via Crucis, as a journey through a time of violence, destruction and persecution. The history of an entire century can be seen represented in this image. Just as the places of the earth are synthetically described in the two images of the mountain and the city, and are directed towards the cross, so too time is presented in a compressed way. In the vision we can recognize the last century as a century of martyrs, a century of suffering and persecution for the Church, a century of World Wars and the many local wars which filled the last fifty years and have inflicted unprecedented forms of cruelty. In the “mirror” of this vision we see passing before us the witnesses of the faith decade by decade. 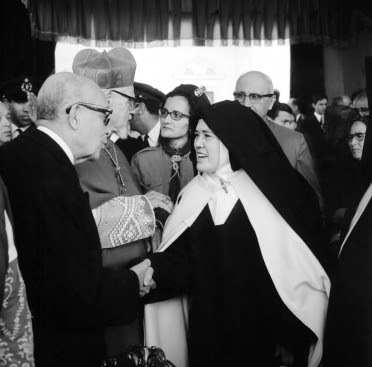 Here it would be appropriate to mention a phrase from the letter which Sister Lucia wrote to the Holy Father on 12 May 1982: “The third part of the ‘secret' refers to Our Lady's words: ‘If not, [Russia] will spread her errors throughout the world, causing wars and persecutions of the Church. The good will be martyred; the Holy Father will have much to suffer; various nations will be annihilated'”. In the Via Crucis of an entire century, the figure of the Pope has a special role. In his arduous ascent of the mountain we can undoubtedly see a convergence of different Popes. Beginning from Pius X up to the present Pope, they all shared the sufferings of the century and strove to go forward through all the anguish along the path which leads to the Cross. In the vision, the Pope too is killed along with the martyrs. When, after the attempted assassination on 13 May 1981, the Holy Father had the text of the third part of the “secret” brought to him, was it not inevitable that he should see in it his own fate? He had been very close to death, and he himself explained his survival in the following words: “... it was a mother's hand that guided the bullet's path and in his throes the Pope halted at the threshold of death” (13 May 1994). That here “a mother's hand” had deflected the fateful bullet only shows once more that there is no immutable destiny, that faith and prayer are forces which can influence history and that in the end prayer is more powerful than bullets and faith more powerful than armies. 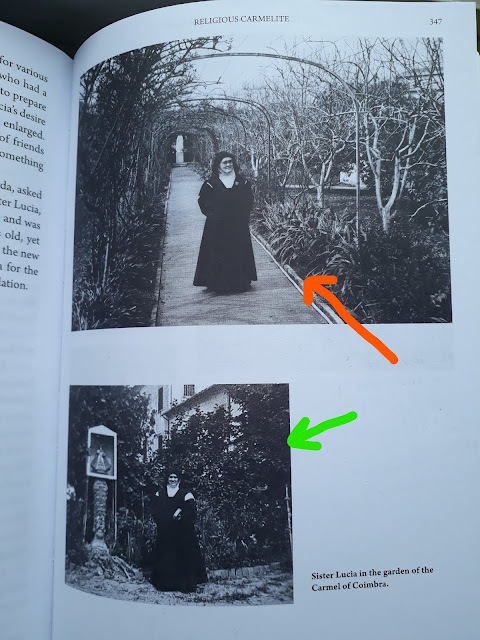 The concluding part of the “secret” uses images which Lucia may have seen in devotional books and which draw their inspiration from long-standing intuitions of faith. It is a consoling vision, which seeks to open a history of blood and tears to the healing power of God. Beneath the arms of the cross angels gather up the blood of the martyrs, and with it they give life to the souls making their way to God. Here, the blood of Christ and the blood of the martyrs are considered as one: the blood of the martyrs runs down from the arms of the cross. The martyrs die in communion with the Passion of Christ, and their death becomes one with his. For the sake of the body of Christ, they complete what is still lacking in his afflictions (cf. Col 1:24). Their life has itself become a Eucharist, part of the mystery of the grain of wheat which in dying yields abundant fruit. The blood of the martyrs is the seed of Christians, said Tertullian. As from Christ's death, from his wounded side, the Church was born, so the death of the witnesses is fruitful for the future life of the Church. Therefore, the vision of the third part of the “secret”, so distressing at first, concludes with an image of hope: no suffering is in vain, and it is a suffering Church, a Church of martyrs, which becomes a sign-post for man in his search for God. The loving arms of God welcome not only those who suffer like Lazarus, who found great solace there and mysteriously represents Christ, who wished to become for us the poor Lazarus. There is something more: from the suffering of the witnesses there comes a purifying and renewing power, because their suffering is the actualization of the suffering of Christ himself and a communication in the here and now of its saving effect. 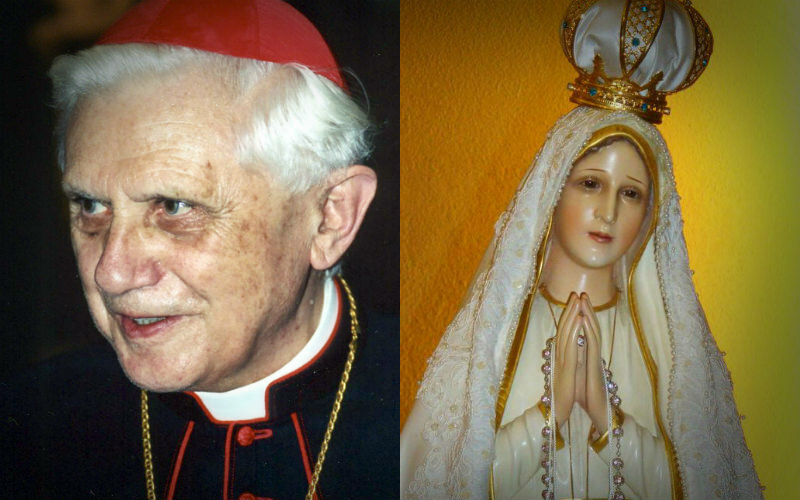 And so we come to the final question: What is the meaning of the “secret” of Fatima as a whole (in its three parts)? What does it say to us? First of all we must affirm with Cardinal Sodano: “... the events to which the third part of the ‘secret' of Fatima refers now seem part of the past”. Insofar as individual events are described, they belong to the past. Those who expected exciting apocalyptic revelations about the end of the world or the future course of history are bound to be disappointed. Fatima does not satisfy our curiosity in this way, just as Christian faith in general cannot be reduced to an object of mere curiosity. What remains was already evident when we began our reflections on the text of the “secret”: the exhortation to prayer as the path of “salvation for souls” and, likewise, the summons to penance and conversion. I would like finally to mention another key expression of the “secret” which has become justly famous: “my Immaculate Heart will triumph”. What does this mean? The Heart open to God, purified by contemplation of God, is stronger than guns and weapons of every kind. The fiat of Mary, the word of her heart, has changed the history of the world, because it brought the Saviour into the world—because, thanks to her Yes, God could become man in our world and remains so for all time. The Evil One has power in this world, as we see and experience continually; he has power because our freedom continually lets itself be led away from God. 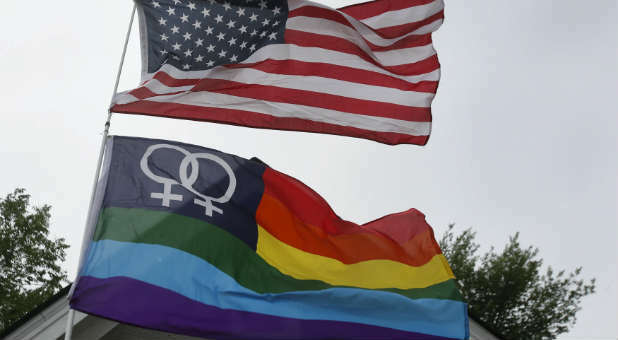 But since God himself took a human heart and has thus steered human freedom towards what is good, the freedom to choose evil no longer has the last word. From that time forth, the word that prevails is this: “In the world you will have tribulation, but take heart; I have overcome the world” (Jn 16:33). The message of Fatima invites us to trust in this promise. Ratzinger asks: if these are "projections of the inner world of children". 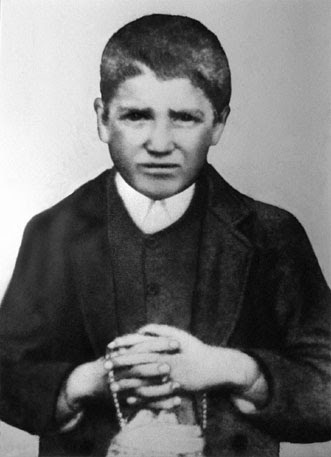 I remember reading elsewhere that he did not believe that Our Lady of Fatima appeared in physical reality, outside of the children as it were, but rather that the apparitions were internal or interior or invisible to the world. That was the first time I found myself displeased with Benedict and disappointed that he held such a weird understanding of the obvious. Laughing gas indeed! The revelation of Fatima doesn't belong to the revelation of the Gospel....it belongs to the category of private revelation, so we can mess with it and run it through our modernist synthesizing machine all we want. Now de Chardin, the Omega point, the piltdown man hoax, we can refer to this ridiculous stuff as being some sort of true "revelation" don't you know, and don't be questioning that! Con men and hoaxers. Let's all wake up to these absurd fraudsters. We can only hope and pray for a public repentance and public penance before he goes to meet his judge. Below it was NO coincidence that P JP2 discontinued the role of the the Devil's Advocate for the Canonizaton process for Escriva. "According to Catholic tradition, a sign of contradiction points to the presence of Christ or the presence of the divine due to the union of that person or reality with God. In his book, Sign of Contradiction, John Paul II says that "sign of contradiction" might be "a distinctive definition of Christ and of his Church." John Paul II stated, in his decree on the heroic virtues of Opus Dei's founder, Josemaría Escrivá: "God allowed him to suffer public attacks. He responded invariably with pardon, to the point of considering his detractors as benefactors. But this Cross was such a source of blessings from heaven that the Servant of God's apostolate [or evangelizing work] spread with astonishing speed." The devil's advocate is not infallible (sorry, sspx, if you are reading this). The Pope IS (and that is Catholic dogma, sorry again sspx), according to the saints and Doctors, he is infallible in canonization of saints and it is a sin to believe otherwise.